National University of Sciences and Technology NUST is among top engineering universities of Pakistan. NUST was established with a goal of providing quality education to its students and to create carrier opportunities. NUST NET test registration will start from 18th Nov and tests will start from 28th Dec. Due to high quality of education their fee structure is also bit high but they also provide need based scholarship opportunities for students. NUST provides a vast range of undergraduate programs for their students including Business Management, students from A level background can also apply for different programs. Their eligibility criteria is not very only 60% marks are required to apply for NUST. 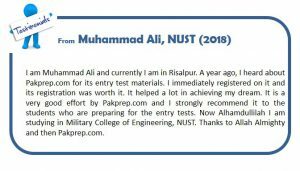 NUST entry test is very difficult and competition is also very high because students from all over Pakistan apply for NUST NET. Pakprep.com is best online entry test preparation website which helped thousands of students over the years to secure admission in their desired universities. Pakprep.com is equipped with more than 15000 quality solved MCQ’s along with their explanation, past papers of top universities, MOCK test and smart analytics. These all features give our students competitive edge against other applicants. To start your preparation today with Pakprep.com please CLICK HERE. 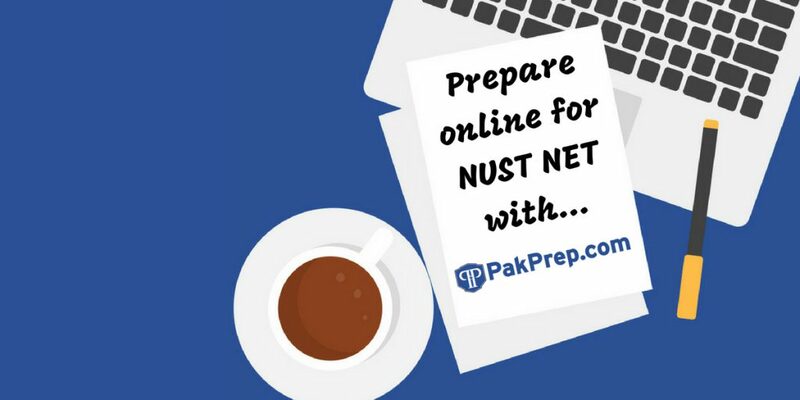 This entry was posted in NUST and tagged A level UG programs, Best way to prepare for NUST, Best website to prepare for NET-I, Best website to prepare for NUST, Best website to prepare for NUST NET-I, Download NUST NET Past Paper, Download NUST Past Papers, How much marks I need in NUST NET?, How to Calculate NUST Aggregate, How to prepare for NUST, How to Prepare for NUST NET 2016, How to Prepare for NUST NET 2017, How to prepare for NUST NET-I, How to prepare NUST NET, How to Register for NUST NET Test, How to register how nust net, Important Maths Topics for NUST NET, Important Physics Topics NUST NET, Marks Required in NUST NET?, NET, NET 1, NET 2, NET 3, NET-I explained MCQ’s, NET-I MCQ’s, NET-I MOCK test, NET-I past papers, NET-I solved MCQ’s, NUST, nust 2015, nust 2016, nust 2017, NUST A level offered programs, NUST A level undergraduate program, nust admission, nust admission 2017, Nust Admission Test, Nust Admission Test 2015, Nust Admission Test 2015 engineering, Nust Admission Test 2016, Nust Admission Test 2016 engineering, Nust Admission Test 2016 NUST NET 2016 Preparation, Nust Admission Test 2017, Nust Admission Test 2017 engineering, Nust Admission Test 2017 NUST NET 2017 Preparation, NUST Aggregate, NUST aggregate 2014, nust Aggregate 2016, nust Aggregate 2017, NUST Biology MCQs, Nust Chemistry MCQs, NUST Eligibility Criteria, nust engineering, NUST Engineering Past Paper, Nust Entrance Test, Nust Entrance Test 2015, Nust Entrance Test 2016, Nust Entrance Test 2017, nust entry test, NUST Entry test 2015 preparation, NUST Entry test 2016 preparation, NUST Entry test 2017 preparation, NUST entry test expected dates, NUST entry test expected dates 2018, nust entry test preparation, NUST explained MCQ’s, NUST FEE Structure, nust financial aid, NUST Integration MCQs, Nust Islamabad, NUST Maths MCQs, nust mcqs, NUST Merit 2014, nust merit list, NUST merit list 2016, NUST MOCK test, NUST Mock Tests, nust net, NUST NET 1, NUST NET 1Paper Pattern, NUST NET 2, NUST NET 2017, NUST NET 2017 Format, NUST NET 2017 MCQs, NUST NET 2017 Physics MCQs, NUST NET 3, NUST NET 3 Preparation Online, NUST NET 3 Solution, NUST NET Biology MCQs, NUST NET Chemistry MCQs, NUST NET Maths MCQs, NUST NET Online Preparation, NUST NET Online Test Preparation, NUST NET Paper Pattern, NUST NET Past Papers, NUST NET Physics MCQs, NUST NET Practice Test, nust net preparation, NUST NET preparation 2016, NUST NET preparation 2017, NUST NET result, NUST NET-I, NUST NET-I eligibility criteria, NUST NET-I entry test, NUST NET-I expected dates, NUST NET-I explained MCQ’s, NUST NET-I MCQ’s, NUST NET-I MOCK test, NUST NET-I past papers, NUST NET-I solved MCQ’s, Nust past paper, NUST Past Papers, NUST Past Papers Engineering, NUST Past Papers Medical, nust physics, Nust Physics MCQs, Nust Practice MCQs, Nust practice test, nust programs, nust scholarships, NUST Semester FEE, NUST Solved MCQs, Nust test, nust undergraduate, nust undergraduate admission, nust undergraduate admissions, nust undergraduate program, nust undergraduate programs, NUST University, online NET-I preparation, online NUST NET-I preparation, online NUST preparation, programs offered by NUST to A level students, Sample NET questions, Sample NET-I Chemistry questions, Sample NET-I Math questions, Sample NET-I Physics questions, Sample NUST Chemistry questions, Sample NUST Math questions, Sample NUST NET-I Chemistry questions, Sample NUST NET-I Math questions, Sample NUST NET-I Physics questions, Sample NUST Physics questions, sample NUST questions, Solved NUST MCQs, Solved NUST Past Paper, Where to prepare, Where to prepare for NET-I, Where to prepare for NUST, Where to prepare for NUST NET-I, Where to prepare for NUST NET-I entry test on November 9, 2018 by Pakprep.com Admin.